From a vineyard that we have done many En Primeur offers from – and visited on the Tour du Vin 2013 – this sparkling offering from Mas de Daumas Gassac is one of our favourites. 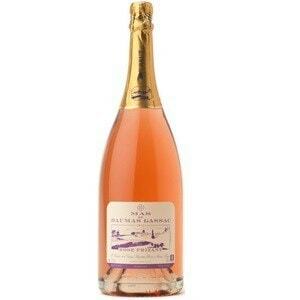 This pretty in pink sparkling MAGNUM is a fantastic alternative to increasingly expensive rosé Champagne. It is made in a similar way to Prosecco so has a gentle fizz and some very soft ripe fruit flavours. A great wine from a world famous producer – for a stunning price of £35.00 per magnum. Ideal for the summer drinking season. 90% Cabernet Sauvignon, 10% Petit Manseng.